Balé Folclórico da Bahia, the only professional folk dance company in Brazil, was formed in 1988 by Walson Botelho and Ninho Reis. Based in Salvador in the northern state of Bahia, and under the leadership of artistic director José Carlos Arandiba, the 32-member troupe of dancers, musicians, and singers performs a repertory that originates from Bahian folkloric dances of African origin and includes slave dances, capoeira, samba, and those that celebrate Carnival. The company highlights the region’s culture within a contemporary theatrical vision. 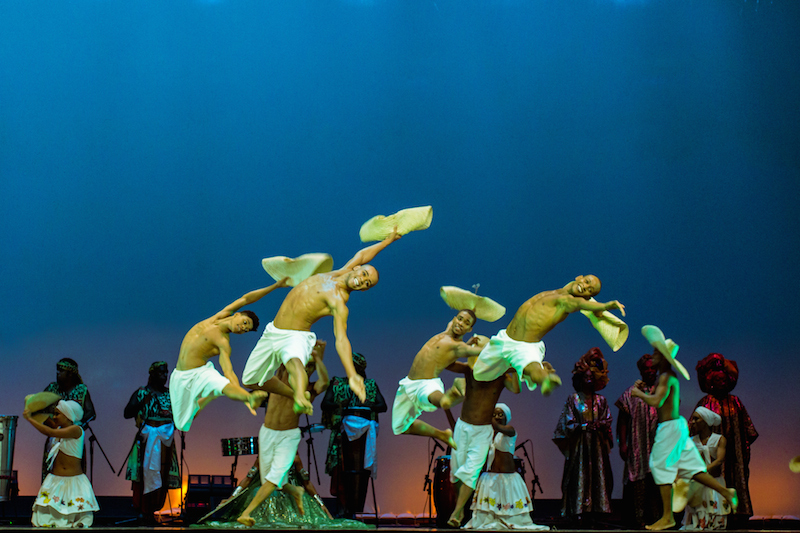 Balé Folclórico da Bahia made its debut in July 1988, at the Joinville Dance Festival where an audience of 20,000 enthusiastically greeted its performance entitled “Bahia de Todas as Cores” (All Colors of Bahia). The troupe’s immediate success brought invitations to perform at other festivals around the country. After being awarded “Best Performance of the Year” by the Ministry of Culture, through the National Institute of Dance, the dance company was invited by the Ministry to tour all of the principal capitals of Brazil, which earned the troupe the acclamation as one of the country’s most important dance companies. Its U.S. debut tour was in 1995-96 and it has since performed in 88 US cities, earning rave reviews and playing to sold-out houses. Maculelê, a mock stick fighting dance, is danced within a roda (circle) of people. The atabaque drum is played and Maculelê songs are sung. People in the roda each have a pair or wooden sticks traditionally made from biriba wood from Brazil. The sticks, called grimas, are used to hit to the beat of the drum. The two people in the roda play and dance to the rhythm. They hit their sticks together for three beats and on every fourth beat, they hit each other’s sticks held by the right hand. The dance is a part of the tradition of Capoeira. During performances, performers traditionally wear grass skirts and some dancers play with machetes instead of wooden sticks. This dance was developed by enslaved Afro-Brazilians cutting down sugar cane in the field.